Pazin's samanj dates back to 1574! 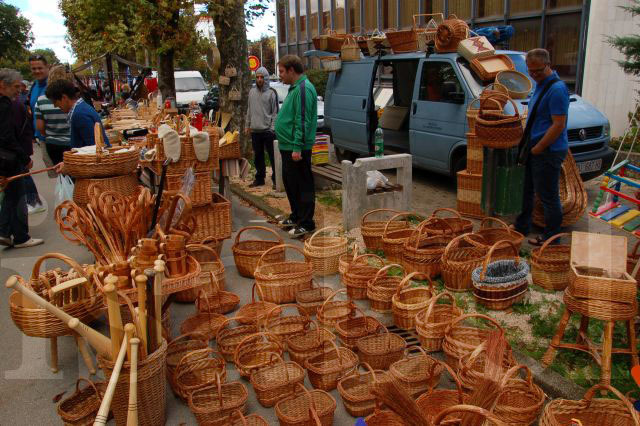 Samanj (sajam in Croatian) is the word for a fair or market, often held once a month. There are many such markets in towns across Istria, which I listed in this post on markets in Istria. People come to these monthly markets not only to trade and buy goods, but also to socialize, catch up with friends, and see what's happening. The only time I've experienced traffic in Pazin, the closest town to us, is on market day. Pazin's samanj dates back to 1574, and has been held on the first Tuesday of the month ever since! This is said to be Istria's biggest traditional fair, but my father says that there used to be many more stalls and traders, so today's samanj must be just a fraction of what it used to be. People used to sell their agricultural produce here, as well as livestock. Today the number of stalls selling fruits and vegetables is limited, and there are a few selling agricultural tools. Most of the merchandise for sale is cheap clothes, shoes, and household items, as well as plants and flowers in the spring and summer. Some traders are local, but many come from other parts of Croatia. S is also for Salamon Palace, an old building here in Gračišće that never fails to intrigue visitors. This reminds me that French lady at the shoe stall in the samanj in Pazin who was asking "Pointure 37! pointure 37!" (in French) to the seller. I'm sure his acute sense of business broke the linguistic barrier. Are those cane baskets hand made locally? or machine made, I am quite sure you require many hands for all the large display of beautiful wares. Yes the baskets are handmade!